The Tripp Lite N201-005-BL Cat6 Snagless Molded Patch Cable delivers stable signals throughout the network. 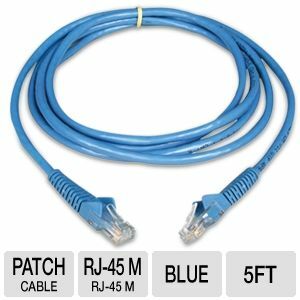 This 5-foot patch cable distributes data, voice and video transfer with up to 550MHz speeds. It comes with a snagless boot that protects the locking tabs on the RJ45 connectors from being damaged during installation. Additionally, this cable is specifically designed for Category 6, Category 5e and Category 5 applications. The Tripp Lite N201-005-BL Cat6 Snagless Molded Patch Cable meets EIA/TIA Cat6 TIA/EIA-568-B-2.1 draft 9 standards and is UL verified. Plus, its copper wire construction and staggered-pin plug design prevent interference and signal loss. Grab the reliable Tripp Lite N201-005-BL Cat6 Snagless Molded Patch Cable today.